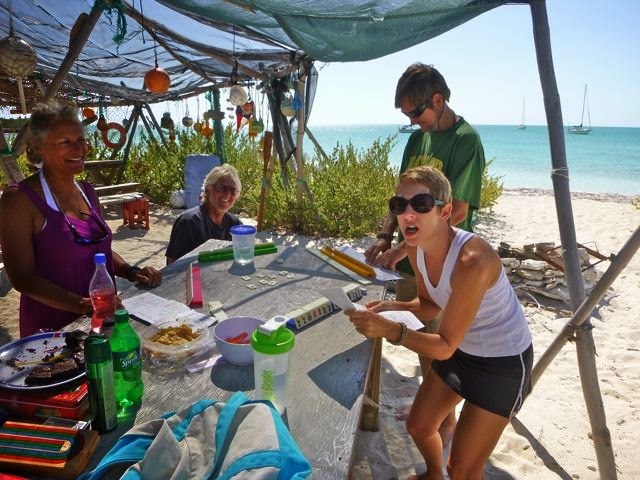 teacher Ann of Krazy Lady at Hog Cay, Ragged Islands. That was 40-some years ago. All kidding aside, it takes some moxy as well as skill to single hand. While Ann jokes about working her way through her nine lives (like the time she parachuted and got suspended, cartoon-like, in the tall bendy tip of tree branch”), she’s smart about safety. at Hatchet Bay Pond, Eleuthera. 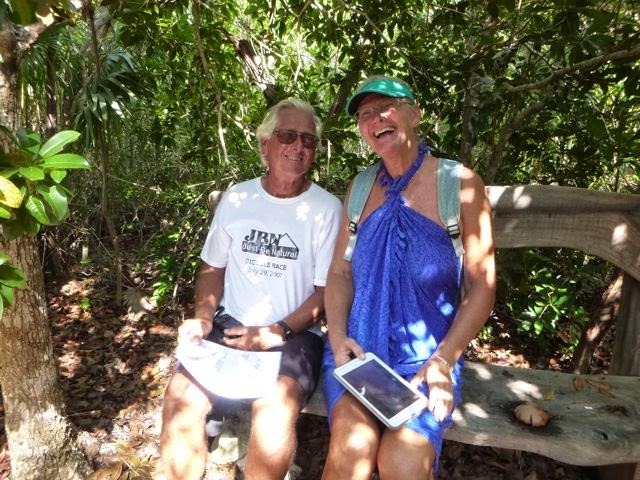 Thus, a bit sheepishly, she recalls when Henry, the Exumas Land and Sea Park ranger, tracked her down when a panicked friend and safety contact decided far too much time had passed since she sent her last “Spot Tracker” location indicator. “I’m sure she’s fine,” Henry assured Ann’s friend, "I just saw her last night at our Superbowl party." Still, he wended his way out to Ann’s boat and made sure she let her friend know she was okay. 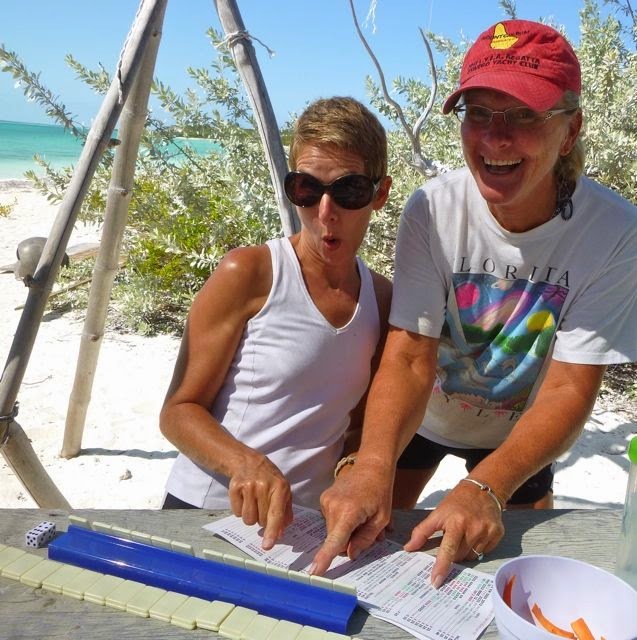 We first met Ann and her single-handing buddy-boat pal Andy Buck of Andante** in the Exumas, but got to know her better when she rounded up us few cruisers at the bottom end of the remote Ragged Islands to play Mah Jong. Besides Ann, none of us knew how to play that complicated game. Maybe it’s all her years teaching “hormones encased in skin” middle schoolers phys ed, Ann was such a great teacher we all had a great time. 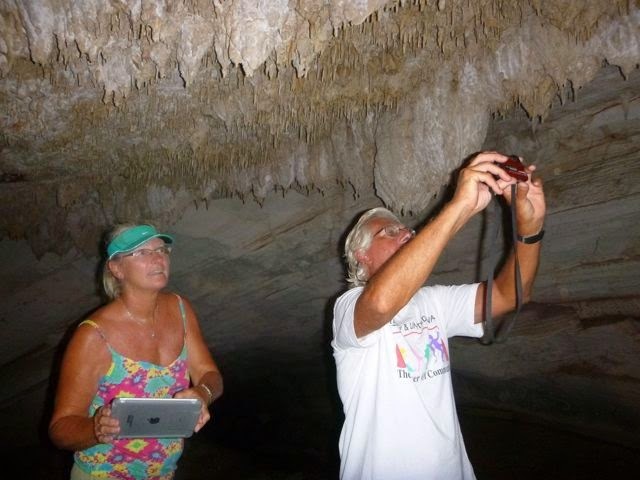 Ann and Andy at Levi Preserve, Eleuthera. Ann’s also a great snorkeling buddy; she keeps a keen eye out for her fellow snorkeler as well the marine life. In the Ragged Islands, her boat was perfectly positioned to watch a turtle mama in her tot. She spotted the only lionfish I’ve seen in the wild when we snorkeled. Despite her apparent devil-may-care attitude and outgoing nature, when I asked Ann about blogging about her, she said, “Don’t say where I am now, or where I’m going. When Cloud 9 blogged about me, it creeped me out when I was recognized from it. And I know three women single-handing cruisers who were active bloggers and were murdered.” Scary! Ann reassured me she hasn't heard that non-solo sailors blogging is a safety risk. 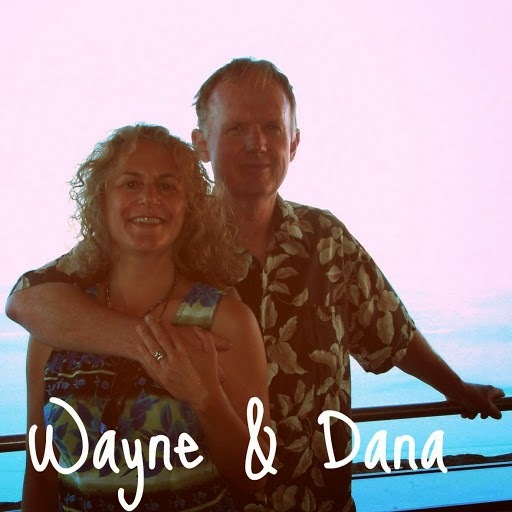 Wayne and I thoroughly enjoyed our time with Ann and Andy. They’re cautious when it makes sense to be (“Let’s hold off on that Abacos passage; waves are 1 ½ meters and winds too light to sail.”). Yet they're daring and curious enough relish a good adventure … road trips, hiking, swimming, spelunking (exploring caves), marine institutes and more. If that's what being a Krazy Lady is all about, sign me up! *For non-boaters, each extra foot is exponentially larger, not just longer. 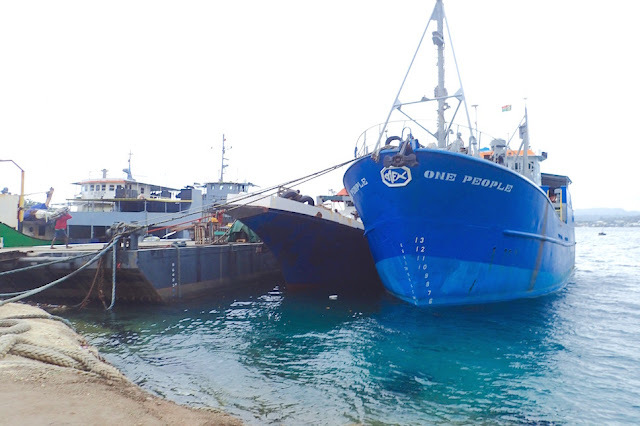 It makes a big difference not just in living space, but also in how much fuel and water a cruiser can carry, and more “boat on the waterline” generally is faster than less. 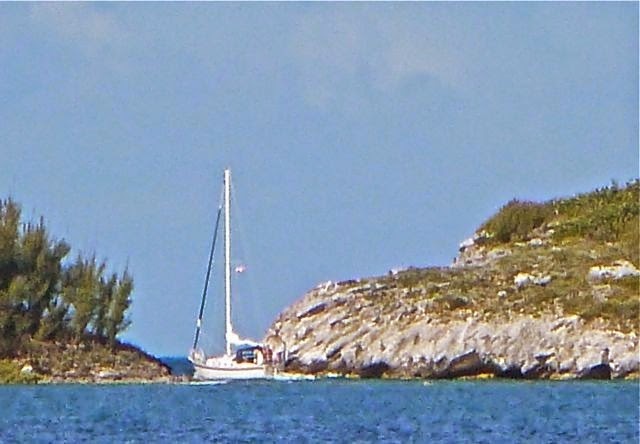 **Ann and Andy began boating together upon meeting in the Bahamas this year. The two have each other’s back; important for a solo sailor, especially when sailing to remote areas. three muskateers, ready for another adventure! May 5, 2014. BAHAMAS. 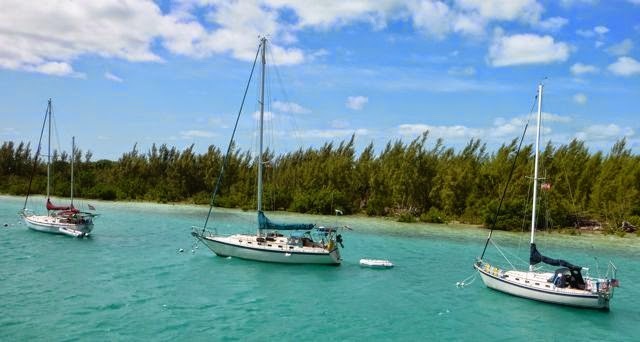 By the time this posts, we'll be anchored off Royal Island (N25.30 W76.50), waiting for enough South or East wind to overnight sail to the Abacos; at least 58 miles.